Last week approximately 3 million people tuned into to watch the debate on evolution between Bill Nye, "The Science Guy," and Ken Ham of the Creation Museum. Ham did a stupendous job articulating the creationist view and contributed greatly to raising awareness to the legitimacy of its claims regarding origins. Enter Pat Robertson via his appearance on the 700 Club television program. During a recent broadcast, Robertson attacked Ham's assertions regarding a Young Earth, more specifically, that the world is approximately 6000 years old. Robertson concluded the view makes a "joke" of Christians. One can appreciate Robertson's acknowledgement of God's sovereignty in the earth's beginnings. But as I once contended in an interview with Seed Magazine, "Clergy...those that have given away a portion of the truth in order to defend the rest of it – are no real friends to true religion or the Bible." Robertson's remarks represent a concession to evolution that has profound negative ramifications for sound theology. First, the concession indicts the goodness of God. Modern science asserts that the geological ages are predicated on the fossil record, and these fossils speak to us of suffering and death millions of years before Adam and Eve – before the creation of man. That's a direct contradiction of the Bible's teaching that pain, anguish; travail, death and the dysfunctions of nature are a direct result of divine judgment because of man's sin. If there was a primeval prevalence of these things before the fall of man, then that would leave only God himself responsible for such menace and mayhem. The very notion a God of love and order would work arbitrarily and brutally as suggested in evolution's old earth hypothesis – a way so contrary to his own nature – carries with it an implication blasphemy. Second, the concession assails the authority of the Word of God. The Scriptures claim to be "God breathed," (2 Timothy 3:16), meaning they are without error and infallible. The biblical record is of divine authority and instructs concerning man's origins, his fall into sin, his need for redemption, and the end of all things. Ultimately, we all must give an account of our lives based on the way we have ordered them in accordance with this revelation. 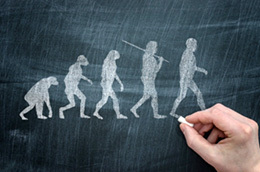 Evolution: World evolved over eons. Bible: Creation is completed (Gen. 2:3). Bible: First life on land. Bible: Man's body created from the dust of the earth (Gen. 2:7). Bible: [Animal life], fixed and distinct kinds (Gen. 1:11, 12, 21, 24, 25; I Cor. 15:38-39). "The fruit of evolution has been all sorts of anti-Christian systems of belief and practice. It has served as an intellectual basis for Hitler's Nazism and Marx's communism. It has prompted apostasy, atheism, secular humanism and libertinism, as well as establishing a basis for ethical relativism, which has spread through society like a cancer. The mind and general welfare of mankind has suffered greatly as a result of this naturalistic philosophy. Although Robertson and some other well-meaning Christians try to reconcile the assertions of evolutionary theory with the Bible, the fact is, the two are in no way compatible. Robertson's remarks trivialize the conflict. Belief in an earth billions of years old, a progressive evolving of earth's life, puts the biblical account in question on several levels. Indeed, Mohler is right, very right. If evolution is true, if the inference of an old earth is correct, then what are we to think of Adam and Eve? Were they pre-hominids or hominids? Did Adam stoop and his knuckles drag the ground when he walked with God in the garden? Did Eve grunt when God asked her what she had done when she ate from the forbidden tree? If the first couple were just early advanced forms of primate, how responsible for their actions could they possibly be? The whole concept is rift with foolish suppositions and ridiculous inquiry. Is this what it means to be made in the image of God? Surely not! Let's face it, the first man of evolution is much different than the Adam described in Genesis or the writings of the apostle Paul in Romans (Rom. 5:12-19), thus casting doubt on the entire story of man's Fall and God's program to save him in the second Adam, Jesus Christ. (I Cor. 15:22, 45,). Theistic evolution as Robertson touted is but a compromise that actually does more harm than good. Ussher's chronology may be a subject of debate, although I believe Ussher was a distinguished scholar and knew considerably more about the chronology of man than his detractors give him credit. Nevertheless, from the biblical record, it becomes impossible to set the date for creation much earlier than 10,000 years. And theological disaster ensues when the speculations of men, no matter how seemingly convincing, supplant God's special revelation – His Word. God is the one who established all scientific laws, and good science will always point to Him. That's why we need not fear there will ever be a discovery of some scientific fact that contradicts the Bible properly interpreted. Therefore, if Robertson believes that Ham's literal interpretation of the biblical creation account is a "joke." Then I suggest Robertson's remarks make him a ham.